If I Were 22 Again…. If I were 22 again, I would move overseas. Many might consider moving to California from The Northeast moving to another country, and it was in many regards, a much more relaxed attitude, a vast land for discovery and the logical next destination having spent my final summer break of college exploring every inch of the Intermountain West… the land of basins & ranges. Since that time, I’ve been fortunate to travel overseas, always trying to spend more time than a week-long whirlwind tour and as quickly as possible getting away from the touristy spots and where I’d run into people just like me or those that have left common decency behind, chasing a “spring break” type experience in an exotic land. But… I’ve never truly lived overseas. Ecuador and Peru for three months were close, yet I still knew I needed to go “home” at the end. Would my life be drastically different having lived in another country? Probably not. Would I value other cultures, and try to intimately understand what has made them what they are today through learning about their past before experiencing them in the present, more than I do now? Again, probably not. Would I be more appreciative of what living in the US has afforded me all these years, the ability to work hard when I want to so I may play hard in mini “gap months” that have punctuated my professional career? Possibly, but not likely. 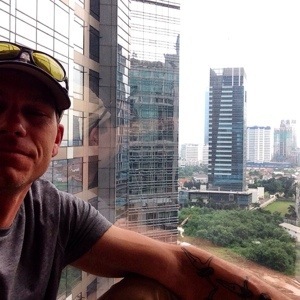 And that’s what I did… which through a wandering course of always following what I would like to do, not what I am forced to do, allows me to be sitting in Jakarta, Indonesia writing this piece… something I never imagined 18 years ago. Next Next post: Digital vs Print Photography, Killing Time in Jakarta.